Stand up paddling is one of the fastest growing sports worldwide. SUP can be done on any body of water, from high surf to flat water. It is easy to learn, great exercise, plus you are outside enjoying nature. It's an ideal sport for cross training and for improving core strength and balance. Kids, as well as adults, can enjoy this exciting new sport! Stand Up and Paddle Cape Cod provides lessons, guided tours and SUP board rentals. Stand up paddling comes from Hawaiian heritage as well as back to the early days of Polynesia. The modern sport of SUP originates from the Hawaiian Islands. In the early 1960s, the Beach Boys of Waikiki would stand up on their long boards and paddle out to take pictures of tourists learning to surf, also to get a better view of the incoming surf. 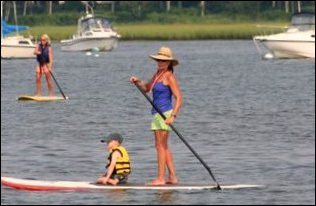 Stand Up and Paddle Cape Cod is located in Osterville, Massachusetts. Cape Cod is a perfect place because there are a variety of bodies of water to be explored. Stand Up and Paddle Cape Cod is done on flat water. SUP Cape Cod will take you to rivers, to lakes, ponds, to Nantucket Sound and Cape Cod Bay. (The location is determined by the weather conditions.) Many of our trips are in Hyannis, Centerville and Osterville, but we do go to many other locations as well. Information on Paddle for the Bays, a benefit for Three Bays Water Quality Programs.